Dr. Neeshat Khan and the staff of Neeshat Khan, DDS offer cosmetic dentistry services to each of their patients. The doctor serves patients who live in and around the San Jose, California area. What is the Difference Between Cosmetic Dentistry and Restorative Dentistry? Cosmetic dentistry and restorative dentistry are very different. While cosmetic dentistry is designed to improve a person's appearance and make a person's smile more appealing, restorative dentistry goes beyond aesthetics. Restorative dentistry corrects any structural abnormalities that may be causing the teeth to shift or become damaged. Cosmetic dentistry includes the use of veneers, onlays, inlays, and bonding agents to help improve the appearance of the teeth. Whitening procedures also fall under the category of cosmetic dentistry. Many procedures that are labeled as cosmetic, may not be covered by most insurance policies. Veneers are small pieces of dental grade porcelain that are formed to cover the front or back of a tooth. A veneer can be used to make small teeth look larger, fill in gaps between the teeth, and can also be used to make the teeth appear whiter and brighter. Before a veneer is applied, the dentist must sand away the surface enamel before applying the bonding agent. Once veneers have been applied, they must continue to be replaced if they are damaged. The loss of the tooth's delicate enamel during the bonding process makes them much more vulnerable to tooth decay if the veneer is ever removed. 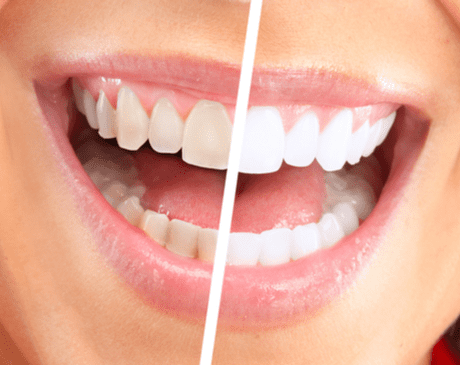 Should Teeth Whitening Systems be Used at Home? When used correctly at home teeth whitening systems are both safe and effective. They are not as powerful as those used in the dentist's office, however, and may take several applications to receive the desired results. It is important to follow the directions exactly so the enamel on the surface of the teeth is not damaged. If a patient wants immediate results without having to worry about damaging their teeth, they can visit their dentist and allow them to perform the procedure. The dentist has access to more powerful systems and can whiten teeth several times faster with just one application that is performed in the office.